The PRECIOUS app has been recognised and registered in the TicSalut Foundation health app observatory. The TicSalut Foundation (Fundació TicSalut) is an agency based Spain within the Ministry of Health that works to promote the development and use of ICT and networking in th e field of health. TicSalut acts as an observatory for new trends, innovation and monitoring of emerging initiatives and provides services for the standardisation and accreditation of products. One of Fundació TicSalut’s key objectives has been to design the Master Plan of Health and Social Mobility, always in line with the strategy of the Catalonia Health Plan 2011-2015 and on commission from the Catalan Department of Health and the Department of Social Welfare and Family. The idea is to work closely with the Mobile World Capital Barcelona (MWC) Foundation to define the strategic plans of Health along with those of the Department of Welfare with respect to mobility and at the same time to make the projects defined in this area operative. The Foundation is therefore commissioned to bring together all projects of mobility and apps developed in the health and also in the social sector. In 2009, Non‐Communicable Diseases (NCDs) accounted for 87% of all deaths and amounted to 70% of the overall healthcare costs in the EU. NCD risk is highly modifiable by changes in lifestyle, and therefore there is a clear need for interventions that cause these changes. Novel approaches need to be patient centric, empowering individuals to be responsible for their own health. Information and Communications Technologies (ICTs) can provide this solution, and this is clearly demonstrated by a recent report from the EU which assessed the socio‐economic impact of m‐Health solutions and found that they offer a potential cost saving of €76 billion in the EU. PRECIOUS (PREventive Care Infrastructure based On Ubiquitous Sensing), a 3 year EU Seventh Framework (FP7) research project (grant agreement no 611366), aims to provide a ubiquitous preventive health care tool that will improve the health of the user and deliver cost savings in the public health sector. 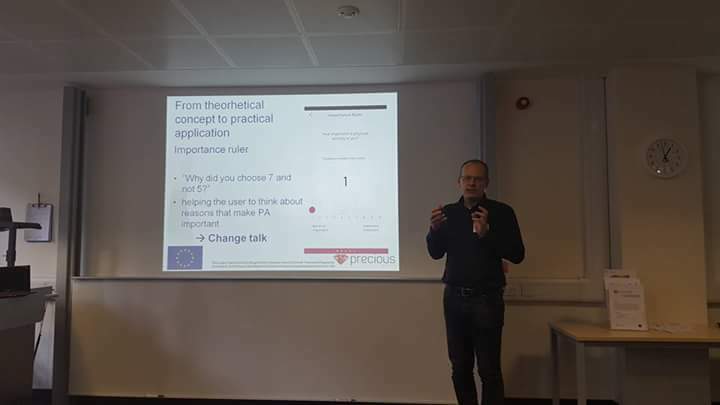 The project aims to use a novel combination of motivational interview and gamification principles, to create a personalised system that adapts to the users’ goals and preferences with an end goal of aiding the user to reduce their risk of developing Type 2 diabetes and cardiovascular diseases. 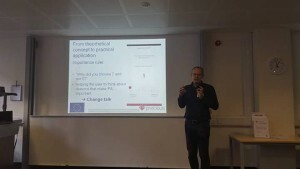 The project is now in its third year and would like to invite key stakeholders to a seminar to explore the future of e‐Health, demonstrate the new PRECIOUS system and provide information about learning’s from the project. 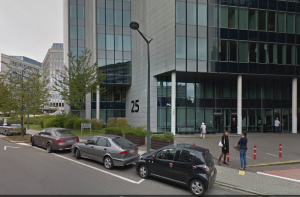 The event will include a presentation from a leading industry expert about the future of e‐health, information about and demonstrations of the PRECIOUS system, along with a presentation from another EU project in the area of e‐health. Refreshments and a light lunch will be provided. Register here. ARE NEW TECHNOLOGIES A RECOGNIZED USEFUL TOOL FOR HEALTHCARE PROVIDERS? Health leaders and medical directors emphasize the need to include information and communication technologies (ICT) in formal healthcare programs considering their potential advantages. However, can healthcare professionals advice mHealth to their patients and are they ready to do so? Today there are more than 2 billion smartphones’ users globally. By 2020, it is expected that this number will be multiplied by 3, reaching more than 6 billion smartphone users. In relation to this, the eHealth sector is experiencing double-digit annual growth and the number of tools and apps is continuously increasing. 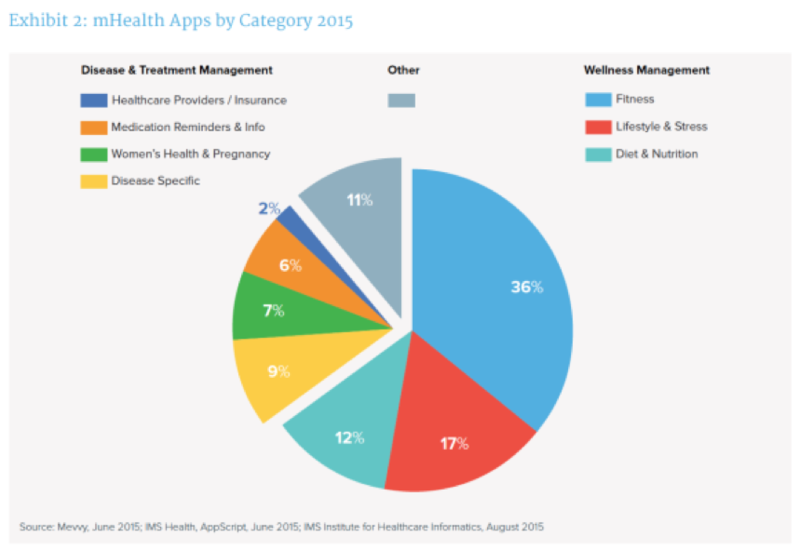 A report from the IMS Institute for Healthcare Informatics has shown that more than 165.000 mHealth apps are now available in the market; more than doubling over the past two years. A high percentage of these apps are focused on healthy lifestyles offering a very attractive offer with different activities and incentives aimed at catching people’s attention (see Figure 1). Physical activity, healthy diet and stress management are star products among this huge offer of apps. The World Health Organization discusses the benefits of using ICT in healthcare settings in terms of better access to information, improved communication between colleagues and patients with health providers, facilitating continuing professional development and providing learning tools for healthcare professionals, patients and the community as a whole. Despite the evidence of the increasingly important role of ICT in healthcare, its use is not widely and homogeneously spread across different countries and healthcare settings. In general, countries differ in their market and social policies (and economies!) readiness for mHealth. In the market readiness criteria (e.g. smartphone penetration, tablet penetration, share of GPs using e-Prescription) the best performing countries often offer more than twice as good market conditions compared to the countries with low rankings. This is important because that means that the decision to prescribe an app is not only a personal bet of a healthcare provider but something that should be regulated, controlled and this must satisfy quality and appropriateness criteria too. 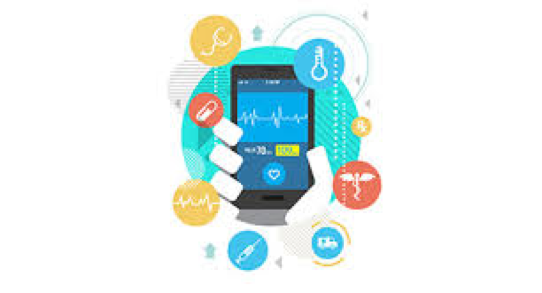 mHealth could prove a major step change opportunity in improving the quality of care and lifestyle of patients suffering from chronic diseases or other conditions, while reducing the cost of care delivery. However, not all professionals feel confident advising to use or prescribing mHealth apps to their patients. Instead, they still use general recommendations that, in most cases, have shown low rates of adherence among patients. To enable global usability of mHealth services with transparency. To develop a secure, trusted service that patients will use. To develop a clear understanding of the role operators wish to play in the mobile healthcare value chain. To tailor the mHealth business model to local situations and regulations since not all the countries have similar socio-economic conditions. To work with the governments and regulators to provide “mHealth friendly regulatory environments” and eliminate concerns about data privacy and confidentiality obligations. To demonstrate the ways that mHealth can be integrated into the existing healthcare workflow. To include the expertise of all agents involved in the design, implementation and use of mHealth solutions to leverage its potentialities. To provide efficacy and cost-benefit studies on mHealth solutions. To develop business models to show clear benefits to healthcare organisations in introducing mHealth solutions. All these challenges can be effectively managed through careful planning and design. Ultimately, mHealth is only effective if adopted by healthcare professionals and patients. Thus, developers and providers must therefore be focused on developing products and services that are easy to use, without additional layers of complexity. Moreover, design and solid theoretical frameworks to build the solution are key elements. Only by ensuring the attractiveness and soundness of the service, we will increase the odds of adherence and usage. The PC software for lifestyle assessment tool is available for download in the download section. The software is supported on windows 7, windows 8 and windows 10. Human intervention study investigating the PRECIOUS Food intake tool. This intervention study is being conducted as part of the wider project ‘PREventive Care Infrastructure based on Ubiquitous Sensing’ (PRECIOUS), which has received funding from the European Union’s Seventh Framework Programme for research, technological development and demonstration under grant agreement no 611366. Overall, PRECIOUS aims to provide a preventive care system to promote healthy lifestyles, and as part of this PRECIOUS aims to develop a new monitoring tool and will investigate the use of motivational techniques to improve usage and motivational levels. The aim of this intervention study is to investigate whether the motivational aspects of the PRECIOUS food intake tool have an impact on user usage and perceived motivation. The study will also asses the usability of the PRECIOUS food intake tool. Assess whether there is a change in perceived motivation of a user when the motivational aspect of the PRECIOUS food intake tool are switched on. Assess whether there is a change in logging of food intake behaviour when the motivational aspect of the PRECIOUS food intake tool are switched on. This study will asses two different elements of the overall food intake application (a food diary element and a challenge element), with each aspect being assessed by sixty participants. Once recruited and given consent, the participants will be divided into four groups. For all four groups a minimum of 30 participants will be firstly asked to complete an online attitudinal questionnaire on day 0. On completion of this questionnaire they will then be asked to download and use either the diary aspect (group 1 &2) or fruit and vegetable challenge aspect (group 3&4) of the PRECIOUS food intake app for 14 days. After 7 days, the participants will be prompted to complete another online questionnaire. After completion of this questionnaire, they will be asked to continue using the app for a further 7 days. After 14 days, the participants will be prompted to complete a final online questionnaire. For groups 1&3, on completion of the questionnaire after 7 days, motivational elements of the PRECIOUS food intake app will be switched on remotely. The participants will not be made aware of this. Data will also be collected remotely from the PRECIOUS server regarding the participants use of the tool during the 14 day user trial. Source of funding: European Union’s Seventh Framework Programme for research, technological development and demonstration under grant agreement no 611366. Thinking of your last meal can you describe how many calories, how much fiber or fat that include? A growing amount of studies indicate a strong relationship between dietary practices, food intake, and health. The literature supports the view that unhealthy nutrition coupled with a sedentary life style is associated with several chronic diseases, such as type 2 diabetes (T2D) and cardiovascular pathologies. Food intake depends on a multitude of psychosocial and cultural factors, such as knowledge, price, convenience, taste, palatability, emotions, and the environment. Poorer diets are also more likely among less-educated and lower-income populations. Although the correlation between nutrition knowledge and dietary practices is not yet fully understood, a few studies suggest that poor food intake might be the result of inadequate or misleading nutrition knowledge. The research also shows that a growing amount of individuals struggle to make healthful decisions, which in turn impacts the individuals’ well-being. In an effort to reduce the impact of nutrition deficits on the individual well-being, education is essential. Traditional lecture-based instructions, print material, and brochure are among the primary means for delivering information. For example, information and recommendations aiming to help people to improve their diets are regularly published. Despite these increased efforts, the outlook is not promising. According to the statistics, more than 50% of the world’s population is expected to be overweight in the next 20 years. Traditional interventions often fail to attract, engage, and motivate the target audience, which in turn impacts the likelihood of understanding, processing, recalling, and retaining the delivered information. Individual lack of interest in the topic, coupled with the intrinsic incapability of these interventions to boost the individual motivation for learning, are common reasons behind insufficient results. New technologies offer new opportunities for delivering nutrition knowledge interventions. 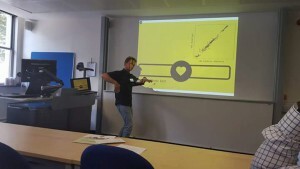 In this regard, gamification referring to the use of game elements in non-game contexts, appears to be a promising option. Under the concept of gamification, serious games have become increasingly popular. Serious games or games for learning (GFL) are computer games that use the fun component of traditional computer games as a tool for increasing the individual motivation for learning and acquiring knowledge. For example, by using traditional game elements, such as points, badges, levels, and challenges, serious games increase the player’s engagement with the game and motivation, which are then used as a tool for promoting education. In other words, while computer games aim to entertain the player, serious games use the entertainment component as a tool for providing knowledge, which in turn might affect the individual’s behavior. Serious games have been applied successfully in domains, such as math, physical exercise, and diet or stress management. By placing the individual in the center of the action and by providing a fun and entertaining experience, serious games and their innovative approach have shown to be a useful, effective, and powerful tool for increasing the player’s motivation to acquire new knowledge, which in turn impacts the individual behavior (Hays, 2005). We carried out a study examining whether a serious game can be used to enhance the individual food knowledge and to increase the individual motivation towards healthful diets. For the purpose of this study, a computer game was created collaboratively by the University of Helsinki and the University of Vienna. In the laboratory study carried out in Helsinki, the participants were presented with the serious game made of two tasks, a food ranking task and a sports game. In the beginning of the game, the player is asked to customize his/her own avatar on several dimensions. The objective of the player in the food ranking task is to rank in order (images of) foods on the basis of given criteria, whereas the objective of the player in the sports game is to win the opponent in a sports-like competition. At the end of each food ranking subtask, feedback (correct nutrition values) is given. More specifically, it was asked whether coupling the performance in the food ranking task with the performance in the intrinsically motivating sports game influences encoding of (memory for) nutritional information and attitudes/approach motivation towards healthy/unhealthy foods. In one experimental condition, the ability to beat the opponent in the sports game depends on the player’s performance in the food ranking task, whereas in the other condition, it does not. That is, the player’s performance in the food ranking task has an impact on the avatar’s outlook (smile/frown, fit/unfit) as well as speed and strength in the sports game. It was also asked whether the type of the opponent influences the outcome variables. Therefore, the game was played either against another human or against artificial intelligence (computer). To assess learning, we used a recognition (multiple choice) memory test on nutritional information. To assess approach motivation, we measured electroencephalographic (EEG) asymmetry over the prefrontal cortex in response to images of healthy/unhealthy foods. In addition to traditional self-report measures, other emotion-related physiological measures were also used, including facial electromyography (EMG, facial muscle activity), electrodermal activity (EDA), and electrocardiography (ECG, cardiac activity) (Consultant: Dr. A. Wölfel). We have now collected data over 60 participants. According to more detailed scientific research questions we are hoping to have information also does this play really increase the food related knowledge (remember the amount of actual ingredient information) or does it had effect on approach motivation (e.g. dislike of unhealthy food). Information related nutrition and health is one of the most examined area that have lot of public interest. There is huge amount of information that people can learn of their diet. Our approach to combine serious games and food knowledge could be on path to follow to increase food knowledge that may lead to successful behaviour change to prevent obesity and related diseases. This is information will be use when we are design PRECIOUS system that include several behaviour change techniques as delivering information (of food). It is not only what information we will deliver but how to make that information delivery successful and our approach is do that with serious game approach. Assessment of the usability of electronic food intake and physical activity monitoring applications. Healthier lifestyles are associated with the reduced risk of diseases such as type 2 diabetes and cardiovascular diseases. Advances in technology have enabled individuals to readily monitor disease-risk related lifestyle attributes such as diet and physical activity (e.g. via smart phone applications or wearable technology). Motivating individuals to react to collected data via lifestyle modifications in order to reduce their risk of disease remains a significant challenge to application development however. The main objective of PRECIOUS is to provide a preventive health care system that will improve the health of the user and deliver public health cost savings. Application usability is known to be a controlling parameter in ensuring engagement and compliance with such applications, and therefore must be validated in the PRECIOUS application. This summary describes an intervention study undertaken by Campden BRI designed to compare the usability of a novel mobile health tool. Comparisons were made between the PRECIOUS tool and two commercially available food intake and physical activity monitoring mobile device applications. The study examined factors that affect the usability of each mobile health tool for different demographic user groups. the overall liking of the application and the ease with which a user can learn the system in order to start using it. The findings of the study will be used to improve the design of the PRECIOUS. 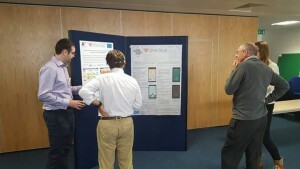 The study examined the usability of three different mobile food intake and physical activity applications (MyFitnessPal®, My Diet Diary® and an application developed by PRECIOUS) for different user groups, with the view to improving the design of the PRECIOUS mobile application. Each participant was assigned a single application to use for a period of seven days. At the end of the period, participants were asked to complete an on-line survey. In total the study involved 250 participants (82-85 per mobile health tool). The participants were in four user groups; age 18 to 35 years, with no children living at home, age 18 to 60 years, with at least one child under 18 years living at home, age 36 to 60 years, with no children living at home, age 61 to 75 years, with no children living at home. The PRECIOUS application was found to be significantly harder to use than the other applications. This was reflected by the higher percentage of users not using the app every day (49% compared to 29% for My Diet Diary Calorie Counter® and 17% MyFitnessPal®). It was also found that 81% of the participants who used the PRECIOUS application disagreed with the statement that there was clear guidance on how to use the application, whereas 58% of the MyFitnessPal® agreed with the statement. For the statement “the app allowed me to input the correct food I had eaten”, 71% of the PRECIOUS users disagreed with this statement compared to 54% for My Diet Diary Calorie Counter® and 28% for MyFitnessPal®. However, all respondents reported some difficulties with all applications, due to databases often containing American products. Overall there was consensus within and across the four user groups, with the exception of the group containing 61-75 year olds with no children at home, which showed some variation in their perception of some usability functions. Campden BRI have been able to show that the current PRECIOUS application being developed, did not perform as well as MyFitnessPal® and My Diet Diary Calorie Counter® in terms of usability. The next phase of the project will use these findings to further develop and improve the PRECIOUS food intake and physical activity application. The study has highlighted that there are several key aspects that affect the perceived usability of these types of applications; and that there are several opportunities for the PRECIOUS application to improve its usability. Based on these findings, further developments of the application is planned and work with a usability designer to ensure the final integrated system is usable and motivates individuals to improve their health. Novel technologies are showing increasing promise in enabling individuals to manage their own health. PRECIOUS will provide an alternative technological application-based approach to reducing consumers’ risk of type 2 diabetes and cardiovascular disease by helping them to manage their own risk. This study compared the usability of the PRECIOUS food intake and physical activity application to other similar commercially available applications. The results showed the importance of keeping consumers’ needs central to product design. These findings will guide the future design of the PRECIOUS system in terms of usability, with the end objective of ensuring longer usage and longer term behaviour changes.